I sit in an airplane flying with its nose pointed to the West. I am traveling to Tucson, Arizona. 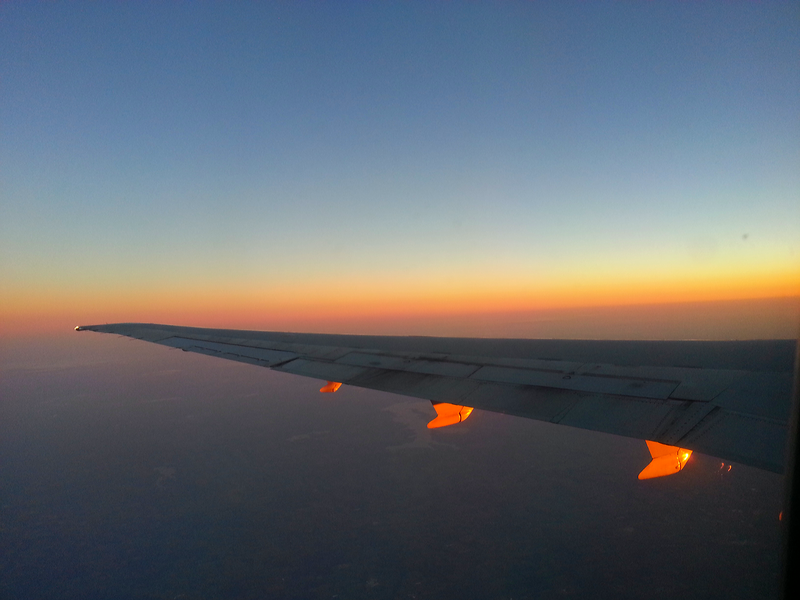 My husband sits next to me and I am peering out the window at a wing that looks like it is being carried in the sky by the light of the sun. Life is good and I am blessed. This weekend I am celebrating a big, threshold birthday. It comes with a new, yet uneasy status. A rite of passage that makes it possible to define my work status. I guess it would be considered by many a step towards a freedom to decide how I spend and invest my time and talent. For me, it signals a responsibility to set a course that taps into my God-given talents to fulfill my purpose in life. I believe the degree of my happiness and self-worth will be in direct measure to finding, unleashing and using my truest talents for my own benefit and in service to others. As I celebrate this birthday and the many rewards of this milestone, I give thanks for the many blessings that are being bestowed upon me. I will even give thanks for the struggles that are sure to come as I explore and breakthrough to new experiences. Note: I wrote and saved this post in May as I was traveling to Tucson, Arizona to visit friends and celebrate my birthday. These were the thoughts I had about my new, free from the demands of a job, status. It is a new reality that I will continue to explore and experience. A belated Happy Birthday to you! I hope you’ll share this new journey with us. Patti, thank you for the birthday wishes! I am excited about this new chapter in life full of (I am sure) of many twists and turns! Beautiful picture and inspirational thoughts. Happy Birthday (a little belated)! Deb, thanks for your continued to support and encouragement!